Now that we are living off one and a half incomes (while I receive paid parental leave), we are having to be a little more careful with our money. 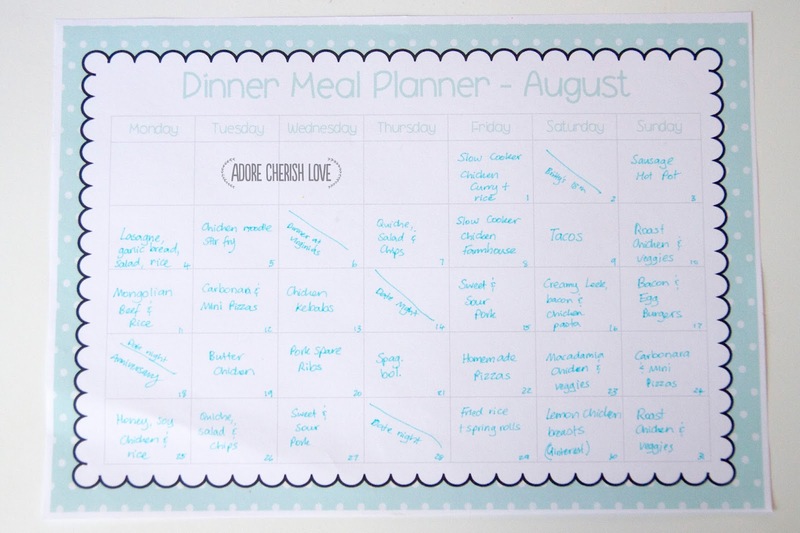 I've been meal planning for most of this year but usually only plan a week at a time so I've decided to plan for an entire month of dinner meals!!! So this is how it works - first I sit down and look at what we have in the pantry and freezer so I planned our first two weeks just based on what we already have. I also wrote in the nights that I know we won't be home and planned a couple of flexible date nights where we can either order take-away or go out for dinner - we often go late night shopping of a Thursday so this works well. Once we've got the plan, I write up our shopping list with any extra meat for the two weeks and fruit/veggies for the first two weeks. We will do another little shop half way through the month for more fruit/veggies and probably a weekly shop for bread/milk. Here is my completed plan for the month of August! 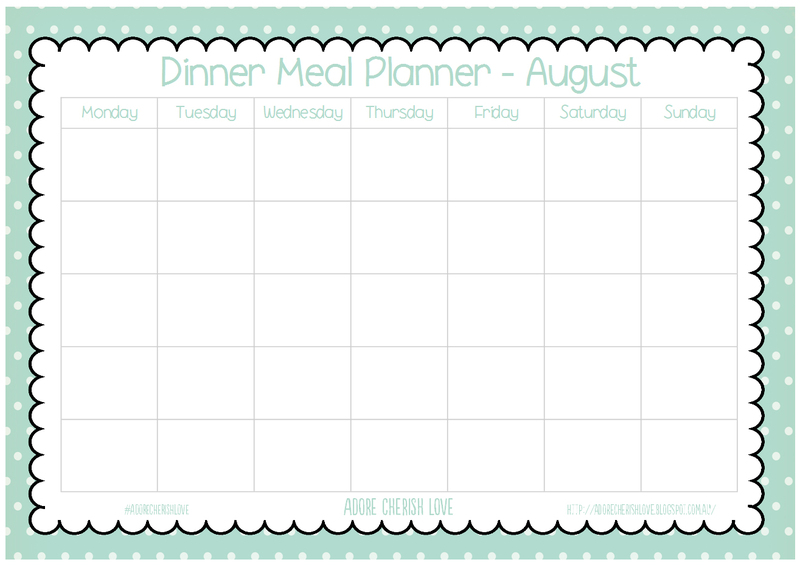 I have made my template free to download for anybody else that would like to have a go at monthly meal plans. Simply click any of the photos in this post or click here to download your own version. Don't forget to share your completed meal plan on instagram with the hashtag #adorecherishlove so we can all get some delicious food inspiration! So what about lunch? Sometimes I will make a double batch and freeze the leftovers for easy lunches and then we also stock the pantry with things like noodles and frozen meals. I will usually have leftovers, sandwiches or something easy like wedges or sausage rolls and hubby takes sandwiches. Breakfast is usually wheatbix or toast.